Who says that there's no decent vintage stuff at car boots and jumble sales these days? Not me, that's for sure! I bought so much today that I'm going to have to blog about it in installments to save you from getting bored. As soon as I'd paid my 20p and gone inside the church hall I spotted some sparkly stuff glinting at me from the table. As usual I grabbed everything, paid and stuffed it all in my bin bag, not examining anything until I got home. The first item turned out to be this 1970's era maxi dress by Spinney. I nearly died on the spot when I discovered all that lovely lurex was a seventies-tastic catsuit. It's handmade and just fabulous. I can't wait to wear this, in fact I love it so much I might never take it off. At first I thought these sequinned pants were those ubiquitous high street ones that were all the rage a couple of years ago, but no, they're vintage, by 1970's British label, Ann Green and silk-lined. The hand-made crochet shawl was another discovery. As everything was 25p an item that's a decent haul for a quid. The boot sale was also quite good. Within seconds of arriving we bumped into an old mate who tipped us off about cheap India flights and a boutique festival we hadn't heard about. This English-made 1970's fake fur coat by Quelrayn was £2. I've got rather a lot of fake fur coats but most are a bit on the big side so they're out and this one's a keeper. This Caraselle Headliner scarf is still in it's original 1960's packaging. You can wear it in a variety of ways and has a plastic beehive protecting band that slots inside to prevent your big hair getting squished. £1 well spent, one hates ruining one's updo. I paid 50p for this March 7th, 1970 issue of Woman's Realm which came in a souvenir carrier bag and originally had two complimentary Tetley tea bags free inside (but were sadly missing). You could send off for this dressmaking pattern for 2 shillings (post paid). A 1955 Falks of Mayfair travel iron which appears to have never been used. There's even an Indian adaptor so maybe it'll come with us next time we go. The nice seller wanted a £1 "because it was old". Believe it not this is the second pair of Salvatore Ferragamo shoes I've picked up this month. The first pair are 1940s and way too small for my huge hooves. This pair of patent heeled loafers fit perfectly. They were £2. They'll look fab with bright opaques and hot pants when it gets colder. Phew! Are you still awake? More to follow soon. What a shocker! I nearly had heart failure when I found this vintage Lee Bender kimono blouse in a charity shop earlier this year, blogged about it, stuck it in the washing machine and then promptly forgot it's existence. 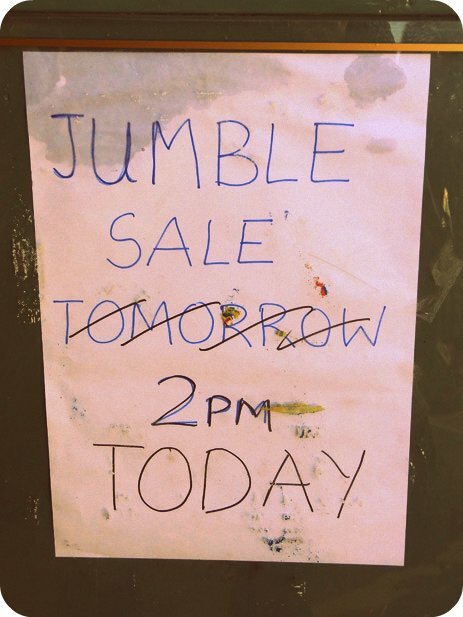 I've obviously got far too many clothes, but that's not going to stop me going to the monthly jumble sale tomorrow or the Thursday morning car boot sale either....tsk tsk, it's almost an addiction. Despite the adverse weather conditions over the weekend my (ethically-sourced) hair feathers are bearing up well. 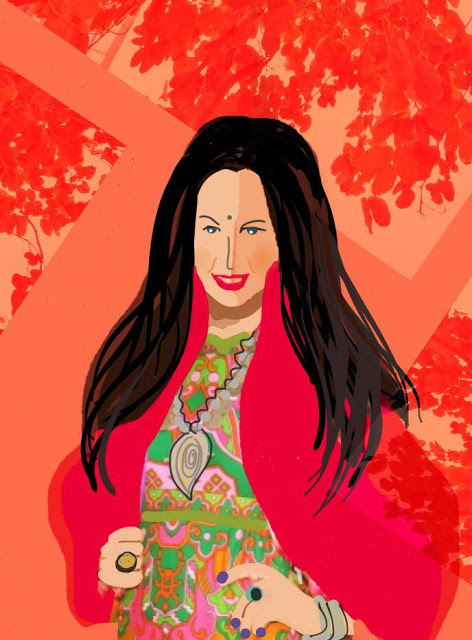 As a self-confessed hair feather hater I was honoured to get a mention on the fabulous Wendy B's blog yesterday who said I (along with Janis Joplin) was the exception to the trend. Lee Bender blouse (£2, Cancer Research) worn with vintage velvet hot pants (70p, car boot sale), velvet tote (25p, jumble sale), suede lace-up go go boots (£1, car boot sale) and stacks of second-hand brass jewellery. I've just about caught up on my sleep, washed every mud-soaked garment I took to Glasto and feel ready to face the booze again. Well, it is The Apprentice tonight and a cheeky glass of something is obligatory on a Wednesday evening. What with dead Tories in toilets, mud galore, acres of trash, a denser population per square mile than Manila and a "violent anti-U2 protest" if you believed the media coverage you'd be forgiven for thinking Glastonbury 2011 was more of a disaster zone than an arts festival. Don't believe the hype, the last six days have utterly rocked! My highlight was Morrissey and I was thrilled that he did loads of the old Smiths stuff. 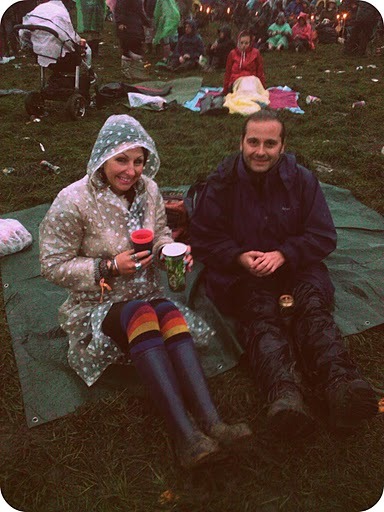 Listening to There Is A Light That Never Goes Out in the pouring rain explains the massive grin I've got on my face. Blazing sunshine and The Smiths would have just seemed wrong. U2 were amazing. I've never been a fan but they won me over (unlike Coldplay, who remain as dull as ditch water). Pendulum, Pulled Apart By Horses and Queens Of The Stone Age delivered the kind of banging hard-edged rock tunes we love. Paul Simon sent me to sleep and Big Audio Dynamite washed over me. I also adored Tinie Tempah and The Wu Tang Clan. The new Spirit of '71 stage offered some crazy retro psychedelia including Steve Hillage and Nick Turner, who both played back in 1971. 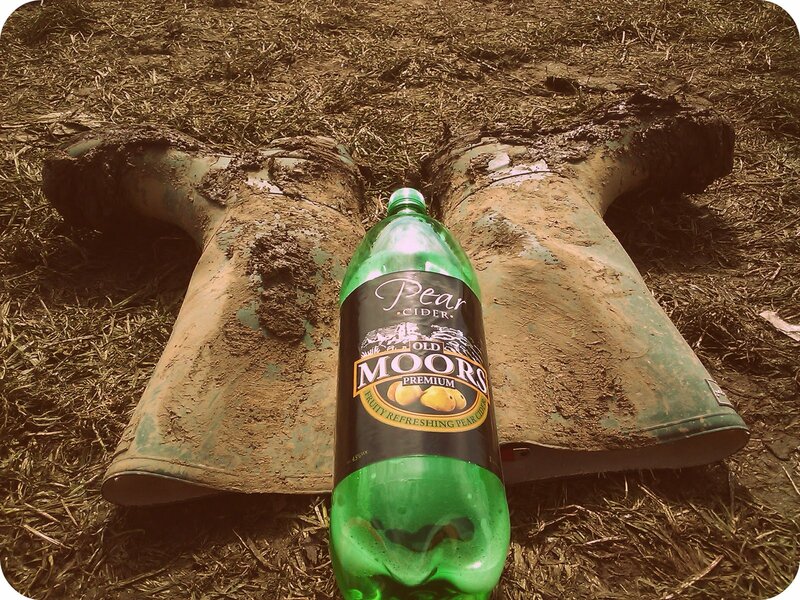 What's a little mud when you've got wellies and pear cider? Glastonbury is the only festival I know which allows you to take your own booze into the arenas and don't believe any toilet tales either, there were no loo queues throughout the entire festival and that includes the ones by the Pyramid stage after the headliners. I didn't spot a single celeb but felt a bit like one myself after being stopped by blog readers. I've returned with a suntan, a heap of muddy clothes and a bad back but I've got ten days to recover until we do it all again. Peace, love and happiness - kinda sums up our week. We were originally heading off to Glastonbury tomorrow but our friends are already on their way so we're off tonight instead. The cat sitters are sorted, there's enough lettuce in the fridge to keep Jacob (our tortoise) happy and Gilbert's positively groaning under the weight of booze and nibbles. I'm trialing these Royal Feathers hair extensions at Glastonbury. I'm not into advertising as a rule but the fact they are handmade in the UK and something I might actually buy myself swayed me. I'll let you know how they've survived the inevitable mudbath when I get back. A big thank you to my lovely friend, Mrs That's Not My Age, who sent me a prettily packaged Lipcote as a Glasto gift, something my make-up bag never used to be without. I applied it at 11am this morning and despite lunch, gallons of tea and one of Jon's pizzas my lipstick is still as bright as it was when I put it on. Wearing: 1960s St Michael nightdress (£1.50, charity stall) with my trusty denim waistcoat, vintage leather knee boots and my white vinyl suitcase packed with everything from bikinis, wellies, sunhats and shawls to false eyelashes, floral headpieces and enormous earrings. Hopefully by sunrise we'll be parked up, awning and bunting in situ and our first cider on the go. Whilst chatting on MSN Messenger to my beautiful friend Sarah yesterday, she asked what I was wearing. I have to admit I was stumped on how to describe this odd 1970s garment I inherited from Mum. It's a tricky one, an all-in-one asymmetric dress with cuffed trousers built in. Whilst I love it it's not something I'll be taking to any festivals as it's far too tricky for negotiating the portaloos after one too many ciders ( I had enough trouble with it whilst sober in Mumbai). I found this in with a pile of shower curtains at a jumble sale recently. It's a 1950s plastic hairdresser's cape and perfect for covering my clothes when I dye my hair as I do have a tendency to stain everything around me. 5p well spent, I'd say. Here's something Jon thought he'd never see, my completed Glastonbury packing in all it's psychedelic glory and much of it courtesy of my fabulous blogging buddies Sarah, Helga and Desiree. I've just got to get my jewellery together and I'm done, ready for Wednesday.The jury's out about the best time to set off, the sooner the better for me. When I got up yesterday morning I was greeted with a surprise parcel from my style inspiration, the vision of loveliness that is Desiree. Look at those colours. There's nothing that gets my pulse racing more than a splash of psychedelia. Want to see them on? A stunning pure silk jumpsuit that fits to perfection and which I was so excited by that I had to go out in last night. I was showered with compliments from my friends and random strangers alike and managed not to spill curry or lager down it either. Such gloomy kitchen shots but a sudden shower meant a quick indoor photo before we dashed off to get the bus. The kitchen wall behind the sink needs plastering, it's all I'm noticing. This 1970's tab collared blouse compliments Gilbert perfectly. When we go to CamperJam, a Volkwagen-themed festival in July, I like to wear plenty of orange to match our bus. My vintage Dunlop wellies got a thorough clean earlier in readiness for next week. How divine is the print on this monochrome maxi? Don't faint but I did some housework yesterday (I always clean manically when I'm going away) so there was actually floor space in the bedroom. Can you see my poodle collection on the fireplace? After admiring the domino brooch darling Lakota had made on her blog she very kindly offered to make me one. I choose a 4 and a 5 to mark the age I'll be in December. Isn't it fab? The fabulous Kitty sent me this stunning jesso frame with a flier promoting the Brisbane Vintage Fashion Fair in which she recently took part and got to meet up with Desiree at the same time. The vintage lace, peacock feathers and flower are just gorgeous. Hope you enjoy the rest of your weekends. Jon's threatened to lock me in the bedroom until I've packed for Glastonbury so that's my afternoon taken care of. 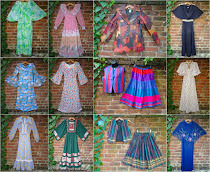 You've probably seen this dress before, I bought my 1970's Kati at Laura Phillips maxi from the "20p Man" at the Thursday car boot sale last spring and it's been regularly cropping up on my blog ever since. Many of my fellow swimmers marvel at "the effort" I put in with dressing for a morning swim. 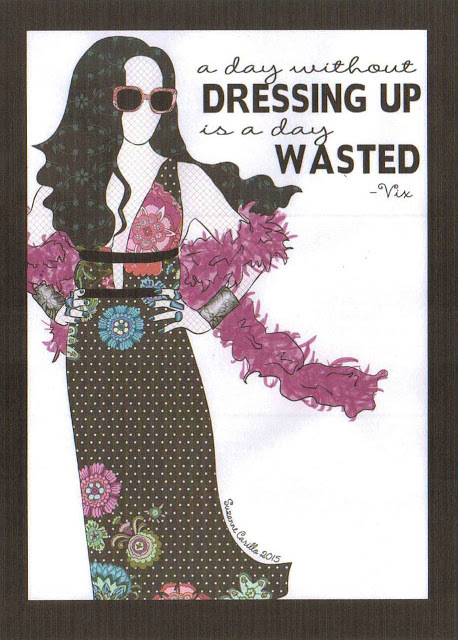 I don't get it, what could be easier than wearing a maxi dress? Bikini on, boots on, frock on, zip it up and off you go, no need to bother about co-ordinating separates or the right shoes. There's nothing worse than wrestling to get dressed after a swim either, despite showering the chlorine makes your skin sticky and trying to pull up skinny jeans is nigh on impossible. With a fabulous frock I rarely even bother with underwear, it's just wash, dry and go. What a surprise, it's raining again. We're off to the pub later followed by a posh Gujarati dinner in our favourite Indian restaurant. I was going to test out my vintage Clairol heated rollers but by the time I've walked to the pub in this weather I may as well not have bothered. Despite the promising start, within minutes of setting off for this morning's car boot sale the heavens opened and we had to turn back. Deprived of our regular Thursday morning bargain fix we headed to nearby West Bromwich for a charity shopping session instead. Being a down-at-heel area the charities really appreciate everything they're given and the shops are always crammed with stock. To my trained eye I can usually tell at a glance whether there's anything to my tastes but here I have to manually rifle through each and every rail in search of hidden treasure. As, like the rest of the Black Country, it's a town of deprivation and high unemployment, prices are low and there's even a couple of clearance shops where donated stock that hasn't sold in other branches gets marked down to under £2 for a speedy sale. How I love these insane Bronx sandals (£2.99). I hope it'll be dry enough to wear them at Glastonbury. A cute 1970's St Michael seersucker A-Line skirt (£1.50), I remember my Mum having one of these . The books were reduced from 50p each (already cheap) to 3 for a £1, so it seemed rude not to snaffle a pile. After the awesomeness that was Drop City, TC Boyle is my new favourite. I read Douglas Coupland's Generation X years ago, it's well worth revisiting. Vintage Brutus denim shirt for Jon (£3). Jon says I've got too many pairs of vintage sunglasses so he's bagged these vintage tortoiseshell Ray-Bans (£2.99) for himself, the cheeky monkey. An ancient PIFCO electric tie press with the original Bakelite plug still attached (50p). I have an inherent weakness for vintage grooming products. A straw bucket hat, made in Mexico, with appliqued butterflies. I think the lady thought I was mad for liking it so she insisted on giving it to me for free. These festival-friendly fringed shorts and the purple suede bolero jacket were both off the £1 rail. I'm not usually that keen on the Eighties but couldn't resist either. My favourite find? This 1960's mini dress by Shannon Marie of Honolulu, bought for £1.99. From Hawaii to West Brom, how bizarre! PS My fabulous friend, the Comtesse received her swap parcel today. Look how gorgeous she looks!